Few things make a hot day more bearable than a cool pool in your backyard. A beautiful pool can become the center of family life and entertaining. The long-debated question about swimming pools is whether an in-ground or above-ground pool is the better choice for your home. The details below should help you decide which is right for you. An in-ground pool has more variety available regarding shape, size, and added features than an above-ground pool. The in-ground pool can be a long lap pool or a rectangular or round pool for relaxing and playing with friends. The shape possibilities are almost endless. The square footage of the water is limited only by the homeowner’s budget, imagination, and property boundaries. Residential pools usually are no more than 9 to 11 feet deep. Above-ground pools, however, are more limited in size, shape, and depth since they come in a kit delivered to your home. They are usually 12 to 33 feet in diameter, 48 to 52 inches deep, and typically round or oval. In-ground pools can be made of a hard surface like concrete, which is usually gunite 1, fiberglass 2, or they can have a vinyl 3 liner 4. The plaster 5/gunite 1 surface can be colored, and ceramic tile can be laid around the top edge of the pool to produce an attractive look. Also, you have more variety of pool shapes and sizes with a gunite 1 pool. Pools with a vinyl 3 liner 4 offer fewer size and shape choices but a larger variety of colors and designs. The third type, the fiberglass 2 pool, is a pre-formed pool that is limited in size and shape since it must be delivered to the home already built. Beauty is in the eye of the beholder, but most people see an in-ground pool as the more attractive option. The highest compliment paid to an owner of an above-ground pool is that it looks like an in-ground one! Installing an in-ground pool is a big project that should only be undertaken by professionals. Digging the space for the pool and installing it can take anywhere from one to several weeks depending on the type. Fiberglass 2 and vinyl 3 liner 4 pools can often be completed in one week or less since they are both placed into a hole in the ground. 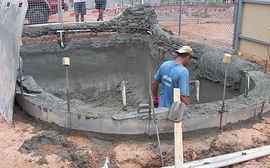 However, gunite 1 pools take much longer because they have more complicated installations. In addition to digging out space for the pool, the gunite 1 layer must be poured in place and then covered with the plaster 5 surface. Finishing touches like ceramic or glass tiles are added afterward. Completing the installation of an above-ground kit can be a DIY project, but a professional installation is recommended since the installers will often provide a warranty. Keep in mind that few pool professionals will install a pool kit if it is not purchased from them, so check carefully before buying a kit online or from another source. The pool itself can be constructed in a much shorter time than any of the in-ground types, about 2½ days by a crew of two. This varies depending on the time required to clear and level the space where the pool will sit. When pricing any new pool, it is important to consider all of the accessories. The pool itself is just the beginning. The decking or treatment of the pool apron, pool filter and treatment type, plumbing and electrical hookups, accessories, and landscaping that may be added to enhance its appearance must also be priced. With all of these factors, the more costly of the two types of pools is the in-ground pool. The national average for an in-ground pool is about $30,000. This pays for a 12- by 24-foot concrete pool with a vinyl 3 retractable cover, concrete apron, and privacy fence 6. Adding a slide, water features, or other special amenities will increase the price to $70,000 or beyond. A fiberglass 2 pool will be slightly more, at about $31,500. A vinyl 3 liner 4 pool will cost about $25,500. These are the costs for the materials. Labor to install an in-ground pool will be about $14 an hour or just over $5.25 per square foot. This makes the total for a 12- by 24-foot concrete pool about $31,500. The above-ground pool, however, has lower material and labor costs. The average cost for an above-ground kit with equipment included is about $13 per square foot. 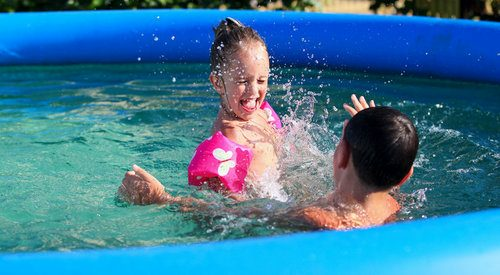 If we purchase an average quality 19-foot-diameter pool kit, the cost will be about $3,700. 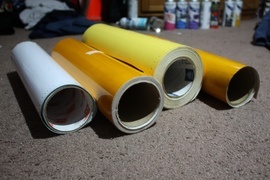 Adding a vinyl 3 cover will add about $620, and a perimeter sidewalk will cost about $130. Finally, adding a privacy fence 6 around the pool will add about $1,350, bringing the total material cost to approximately $5,800. Labor to install an above-ground pool will be just under $9 per square foot, costing about $2,500. This makes the total for a 19-foot-diameter above-ground pool about $8,300. If you decide to add pool decking 7 to your above-ground pool, plan to spend between $4 and $24 per square foot depending on the material, size, and detail. Keeping the water clean is a maintenance task for both types of pools. How this will be done varies depending on whether the system is a chlorine 8 filter system or a saltwater system. Also, both pools will need to have the bottom and sides swept manually or by an automatic pool cleaner. Just by being smaller, the above-ground pool will probably require less of this mandatory maintenance. Durability varies widely by the type of pool. An in-ground pool, especially if it is gunite 1 or fiberglass 2, is less likely to suffer damage. 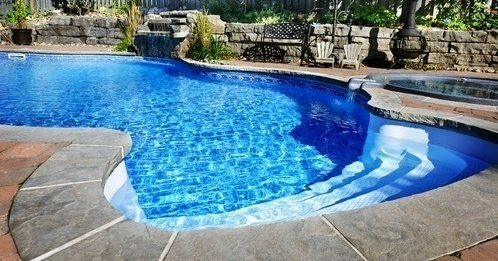 If an in-ground pool is damaged, however, it is more expensive to fix. For the cost of repairing a concrete or fiberglass 2 pool, you can often tear down and replace your above-ground one. An above-ground pool is less durable because its sides are exposed. It is more likely to suffer damage from accidents or storms. In-ground pools can last 50 years or more if properly maintained. This varies somewhat by the type of material used to construct the pool. For example, a concrete or gunite 1 pool will last longer than a fiberglass 2 one. 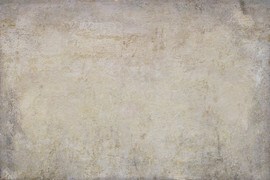 The plaster 5 finish can be resurfaced to help it last even longer. Fiberglass 2 pools, on the other hand, will last 20 to 25 years with a reapplication of the gel-coat finish approximately every 10 years. Vinyl 3 liner 4 pools do not have as long a lifespan as either of these since the vinyl 3 can be punctured or torn by severe weather or misuse. By contrast, an above-ground pool will last only about 25 years with excellent care and maintenance. The typical lifespan is closer to 10 to 15 years. You should always look for a permanent above-ground pool as opposed to a temporary one if you want the pool to last longer. For some homeowners, the shorter lifespan is a reason to have an above-ground pool. They may not be prepared for the long-term commitment of an in-ground pool. Having a swimming pool in your backyard is always a safety concern. Regarding the pools themselves, an above-ground pool seems to be the safer of the two. The natural barrier of the pool wall and the possibility of removing the ladder when the pool is not in use seems to make accidental drownings less likely. According to the Consumer Product Safety Commission, 58 percent of all accidental pool drownings occur with in-ground pools. However, most pools are in-ground pools, so the statistics may not tell the full story. 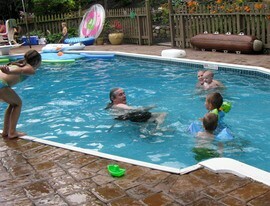 Both types of pools can be made safer for families and uninvited visitors. Four-sided safety fences with self-closing locks are recommended for all pools. 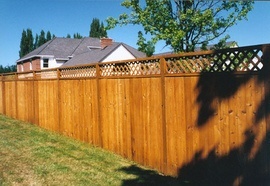 Hard covers are also recommended for the winter if the fence is not permanent. Since 85 percent of the drownings involve children under five, these measures alone can do a great deal to improve the safety of your pool. Other measures include pool alarms and a locking gate. An above-ground pool is more limited in the number of added features. It can have lighting, heating, and a small slide, for example. Due to its shallow depth, it cannot have a diving board, however. In-ground pools, on the other hand, have an almost limitless variety of options available. 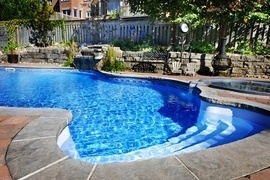 In addition to a diving board and slide, the pool can offer a connected spa or children’s shallow pool. Waterfalls, grottos, fire features, swim-up bars, tanning ledges, and a sloped entry are other possibilities. Above-ground pools can have a wood deck built around them that comes with the pool kit or that is built separately. The area surrounding an in-ground pool is called an apron. It can be of many construction materials and designs incorporating plants and other water features. One of the most practical features that homeowners desire in an in-ground pool is a pool cover. In climates that do not support year-round swimming, a pool cover is a good way to “close” the pool for the winter. They work best on traditional rectangular pool designs. Pool covers can be vinyl 3 for keeping out leaves and other debris, or they can be hard covers that will prevent someone from falling into the pool when the pool is closed. One would think that an in-ground pool would automatically add to the value of a home, particularly in a warm climate where pools are common. However, no automatic appraisal points are added for having an in-ground pool. Whether it will help or hurt the sale of the home depends on the buyer. Not every buyer wants the maintenance and responsibility of a permanent pool. Therefore, an in-ground pool is not a wise resale investment. Whether it is an incentive to purchase a home or not depends on the desires of the home buyer. On the other hand, an in-ground pool does not add to the value of a home. It is not considered permanent. If it is not well maintained and attractive, then it can hurt the resale value. 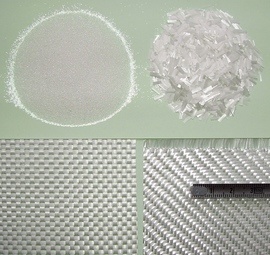 4 Liner: A covering, usually made of vinyl, for the walls and floor of a swimming pool, used to keep the water in and protect the pool's surface. How much does it cost to build an in-ground or an above-ground pool in my city? Cost to build an in-ground or an above-ground pool varies greatly by region (and even by zip code). To get free estimates from local contractors, please indicate yours.